A BBC RADIO presenter has said that she has been told she only has a few days left to live, after doctors were unable to cure her breast cancer. 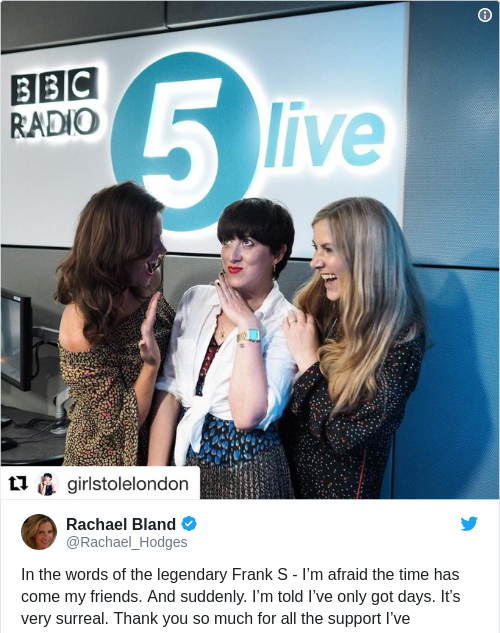 Rachael Bland, a regular news presenter on BBC Radio 5 Live, took to Twitter to announce the news, saying: “In the words of the legendary Frank S – I’m afraid the time has come my friends. And suddenly. I’m told I’ve got only days. It’s very surreal. Thanks so much for all the support I’ve received. Diagnosed in November 2016 with triple negative breast cancer, Bland has appeared on a regular podcast talking about her experiences in You, Me and the Big C. Her co-hosts Deborah James and Lauren Mahon will continue with the podcast. The 40-year-old was told in May this year that her cancer is incurable, and told last month she was not eligible for clinical trials of new treatments because of medical complications. Since May, the cancer has spread further. She said in July that she was in the process of writing a memoir that she could leave behind for her two-year-old son Freddie. Colleagues and friends responded to her tweet praising the presenter. A 5 live colleague Nicky Campbell called her “an astonishing human being” while another, Tony Livesey, said she had “so much courage”. Email “'I'm afraid the time has come': BBC radio presenter says she has just days left to live”. Feedback on “'I'm afraid the time has come': BBC radio presenter says she has just days left to live”.